For my second post at Next Billion, I wrote about a company called Simpa Networks. Simpa was founded by Jacob Winiecki and Mike MacHarg, two people I have known since I started out in the development game. Here is a tangential story about the smallness of the world. I used to work for a consulting firm in Boston. I wanted to work in development but wasn’t sure how to get in the door. I knew I was interested in solar energy and read about a lot of exciting things revolving around energy solutions in the developing world. I went on NextBillion, a blog about market-driven solutions to poverty alleviation, and looked up posts on solar energy. I came across a post on a Brazilian NGO called Ideaas, an organization that focuses on clean energy for the poor. Mike MacHarg had posted a comment about integrating micropayments into the Ideaas business model. He had a Duke email address, so I reached out to him to talk about what he was doing. He happened to be passing through Boston on the way to a wedding in Vermont, so we met up for coffee. He introduced me to Jacob Winiecki, who he’d been working with at Arc Finance, another NGO focusing on rural energy delivery. We talked on the phone, I told him I was applying to Kiva. Arc Finance, as it turned out, was trying to work with Kiva to get an energy loan portfolio going on the website. 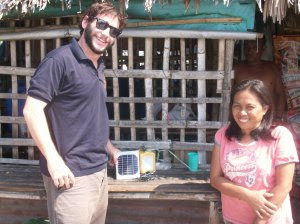 They were piloting a solar lantern program with an MFI in the Philippines and wanted to get the loans up on Kiva’s site. A month later I was accepted to the Kiva Fellows program and given my assignment in the Philippines. As it turned out, I was placed with NWTF, the very same MFI that Arc Finance was doing a pilot with. So, when I got down to Bacolod, I worked together with Kiva, Arc Finance, and NWTF to get the loans up on the website. We were the first MFI in Kiva history to post clean energy loans. Now, things have come full circle. Jacob and Mike started Simpa, and I am writing a profile on the company for the website that started the cycle a year and a half ago. You can read my full piece here. Below is the transcript of an interview I had with Jacob Winiecki to write the piece. Develop Economies: How did Simpa begin? Jacob Winiecki: Simpa grew out of conversations between the three founders discussing how to best utilize advancements in micropayment technologies and, most importantly, the expansion of mobile ownership and mobile money transfer services. Affordability has always been a key challenge in the dissemination of renewable technologies – even in developed markets – and our experience in the energy access space led us to recognize a unique market opportunity. DE: Please explain the problem with energy delivery in the developing world. What have been the challenges in the past? JW: Expenditures on kerosene, charcoal, and other dirty fuels prove that there is an ability to pay for energy services, but only gives us a lower limit guess of what people can “afford”. Based on this data, the market has taken two broad approaches up to this point: build end-user finance opportunities for consumers that can’t afford renewable energy systems on a cash basis (Microfinance Approach), or design smaller, modular products that meet an acceptable up-front cash price (Device Approach). Both paths have faced challenges. With the former, we have learned that it is very difficult to build and scale energy loan portfolios at financial institutions that reach the large under-electrified and unelectrified sector (I’m sure you have seen this directly in Negros). The latter approach is much more prominent at the moment, with companies like d.light and others leading the way in designing and manufacturing at scale to bring down hardware costs. This approach requires manufacturers to sacrifice quality in order to meet a price point, and we are already seeing product problems affecting the reputation of solar and renewable energy in general. Low-cost lamp products also have very little margin to spread across the value chain, making distribution to remote rural areas difficult to afford. DE: What do you see as Simpa’s key innovation? JW: Simpa recognized an opportunity to create a high quality energy system that delivers superior energy services by embedding end-user finance in the product itself. We believe that BoP consumers are willing and able to pay for superior energy if you get the pricing right. We spent a long time learning from the mobile sector. One important driver of the rapid expansion of mobiles has been pay-as-you-go pricing – low-cost hardware cost, followed by fully flexible pricing. We saw an opportunity to not only apply pay-as-you-go pricing to energy, but to use it as a vehicle for making high-quality energy systems “affordable” to the wider market with little access to credit and demands more energy than basic lighting. Pay-as-you-go has been tried – to a certain degree – in the energy sector in the past through fee-for-service initiatives. However, these various projects are closer to a rental model than anything with a large body – usually government – owning the asset itself, and all the typical negative outcomes associated with lack of ownership. Simpa’s pricing model is better described as pay-as-you-go-until-you-own as the consumer is making flexible, usage-based payments depending on their own needs and income streams, with each payment adding up to their eventual full ownership of the system. Simpa aims to turn a perpetual BoP expenditure into asset ownership. DE: Why are energy products difficult to finance? Through our work in the sector over the last 5 years, we have seen that even people with microfinance accounts may not be willing to take on debt for an energy system because MFIs require structured, fixed payments on schedules that do not match income streams. It is a long and difficult task to partner with financial institutions – it takes 6-12 months just to convince them to provide loans for energy, then another quarter to structure an appropriate loan. As the book Portfolios of the Poor points out, the poor have incomes that are small, irregular, and unpredictable – and Simpa has designed a product and pricing strategy that takes this into account . DE: How does the Simpa system work? Through our patent-pending technology, consumers can take home a Simpa energy system with a small down payment. The user then self-installs the system which delivers energy services for a short time. The Simpa hardware then acts like a pre-pay energy meter, regulating the energy use based on prepayment of energy units (Wh consumption). Consumers purchase energy credits via mobile money transfer directly to Simpa, purchasing an energy credit scratch card, or through a local vendor. Simpa sends the consumer a usage code via SMS, which he/she enters into the Simpa system’s Regulator, unlocking the energy for prepaid Watt-Hours purchased. As the client consumes energy, he/she is also moving closer and closer to owning the system. When the purchase price is fully paid off, through use, the system is unlocked permanently to deliver free energy. DE: Where is Simpa today? Where do you see it in the future? We have conducted the first phase of pilot testing in Karnataka, India with our partner SELCO-India (www.selco-india.com). We are now developing the beta hardware/software combo and will launch phase II pilots in India on March 1st. We would like to have 2,000 systems sold by the end of this year, and another 5,000 the following year. The year after that, we are shooting for 10,000 systems sold.